Summer may be over, but that’s no reason to forego flavor, color, and texture in your salads. This gorgeous fall salad brings together some of our favorite cool-weather ingredients in one beautiful and easy meal. The smoky, meaty bacon, the crisp Bosc pear, the hearty leaves of kale and Brussels sprouts, and the crunchy topping of seasoned panko breadcrumbs all work together with a tangy yogurt dressing to make a quick and delectable salad that can easily take center stage on your fall table. Note: Though we think this salad is perfect just as it is, we won’t blame you if you feel like adding some other fall-inspired ingredients to the mix. We particularly like dried cranberries and figs, as well as toasted nuts. Pomegranate seeds make a particularly lovely and bright addition, too. Slowly cook the bacon in a sauté pan over medium heat till it is golden brown and crisp. Pour the fat into a heat-safe ramekin and set aside. Lay the bacon out on a sheet of paper towel to remove excess fat. Chop the bacon finely and tip it into a small mixing bowl along with the thyme, breadcrumbs, and a tablespoon of the reserved bacon fat. Mix well by hand to thoroughly combine the ingredients. Set aside until ready to use. Make the dressing by combining the yogurt, olive oil, salt and pepper, cayenne, and vinegar in a small bowl and whisking well to combine. Tear the kale into bite-sized pieces and place in a large salad bowl. Mix the leaves with the dressing using a firm kneading motion, to soften the kale and to thoroughly distribute the dressing. 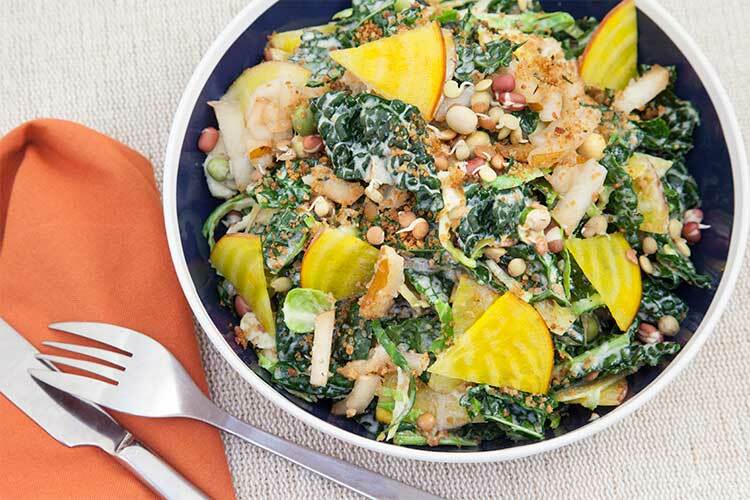 When you can feel the kale beginning to soften in your hands, set the bowl aside for 5–10 minutes. This brief rest is essential to keep the raw kale from being too toothsome. Add the Bosc pear, crunchy sprouts, and sliced beets to the bowl and gently toss to evenly distribute them through the salad. Taste for seasoning at this point and adjust as needed. Top the dressed salad with the seasoned breadcrumbs and serve.